Although much learned today, the common Indian woman sometimes does not possess confidence in dealing with the outside world. She has to face many social as well as family problems and ends up in a disappointing situation. The basic strength of women of Vedic period was “Self-strength”. It is necessary to give back this self-strength to the women and to build a capable woman of tomorrow. The name Aatmabal says everything – the inner power that every woman holds in her but she has to realize it, the power that a woman needs to make efforts to recognize, the power that is deeply embedded in her inner self, which once realized, it gradually becomes part of her personality. Self-strength can be developed from within rather than any external remedy. The woman develops a different vision towards life when she discovers her abilities with the confidence and enthusiasm. And her entire life changes due to this. A woman, be it in any role such as the daughter, wife or mother – plays a very crucial role in building a strong family thread and her children’s personality, which in turn contributes to a powerful society. 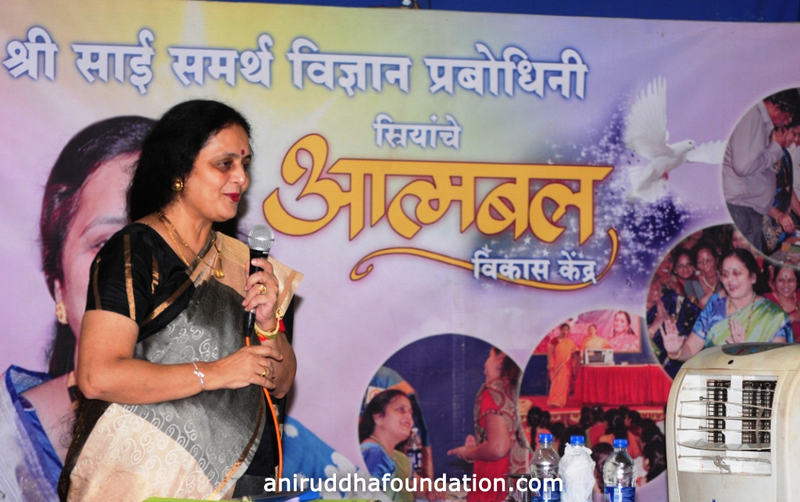 Aatmabal classes were established under the guidance of Sadguru Aniruddha Bapu and his wife Mrs. Nanda Aniruddha Joshi (lovingly known as Nandai). Aatmabal is a venture for women among various activities held in association with ‘Shree Sai Samartha Vidnyan Prabodhini’. The first Aatmabal class was announced in the year 1998 which saw the participation of 28 women. Now, by 2016-17, around 1500-1600 women have been benefitted by these Aatmabal classes. Women come to Mumbai from far off places such as Aurangabad, Jalgaon, Nandurbar. Apart from Mumbai, these classes are now held in Pune as well. 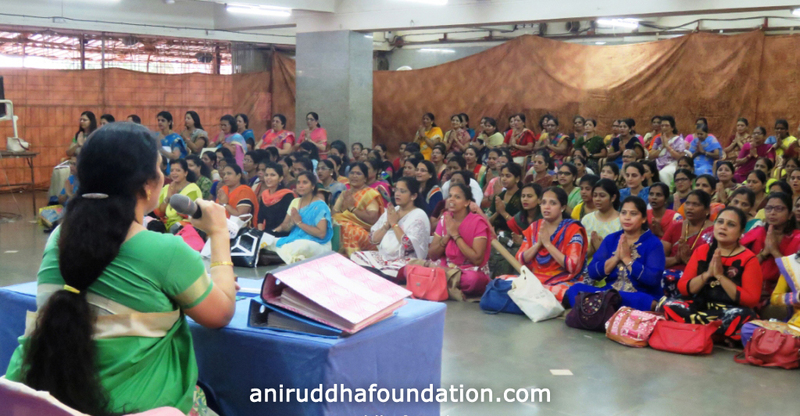 Dr. (Mrs.) Nanda Aniruddha Joshi has been holding the Aatmabal classes to develop the self-confidence and intrinsic abilities of women for their self-development. She has completed Master’s Degree in Biochemistry from University of Mumbai and has mastered the subject of Ayurveda and Naturopathy. She has gained a proficiency in Braille and has taught Braille for 3 years. 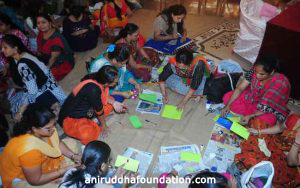 These Aatmabal classes held by her guides two qualities in women by developing their inner strength and confidence and thereby help them to be bold, self-supporting and self-sufficient. The women who are not used to the English language are trained in English and by the end of the classes, these women know the language good enough to help them in their daily lives. 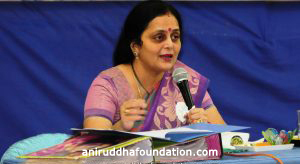 Dr. (Mrs.) Nanda Aniruddha Joshi has sketched this curriculum very diligently. This course consists of one session per week and goes on for 6 months. There are short plays, seminars, projects and presentations dedicated to a specific topic during which the students come in contact with the external world. This course includes Time Management skills through which working women learn to manage their home and office and maintain a balance in life. Special emphasis is placed on how to practice Multi-Tasking effectively. Communicating in English is not only need of the day but it is considered as an essential quality. Ability of Conversation in fluent English increases confidence to face the world. Hence, special emphasis is placed on English conversation in the course. Women who are not at all familiar with English are taught from the very basic. On the concluding evening, music and other events are organized. All the students of this course, without any exceptions about age, business etc. participate enthusiastically. The purpose behind this is to eliminate their stage fear. Dr. (Mrs.) Nanda Aniruddha Joshi conducts every session personally and also actively participates in the framework of courses every year. Not only this, but she also directs the plays and other presentations produced during conclusion.